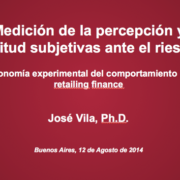 DevStat‘s Scientific Director Jose Vila was the invited lectured for a workshop on the application of Experimental Behavioral Economics to retailing finance and insurance in Buenos Aires (Argentina) on August 12. The workshop was focused in how to measure subjective probabilities of investors and insurance takers and how to apply this information to optimize customer management and generate competitive advantage. 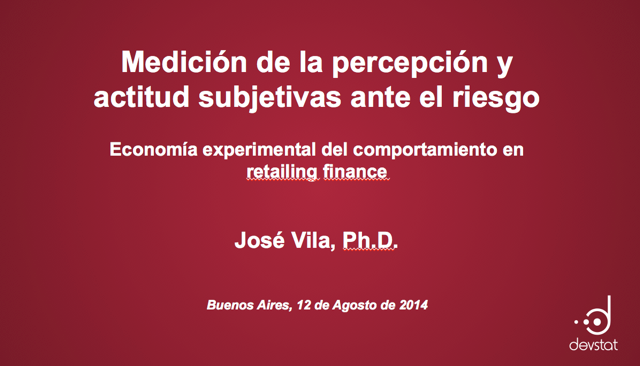 The event was organized by Management & Fit and funded by Banco de la Provincia de Buenos Aires.